'Instead of arresting those involved in terrorising our community, the police has been busy arresting our children,' said the uncle of a 14-year-old boy who was picked up. Mumbai: Sarita Kamble stood in front of the tall, wooden door of the Dongri Observation Home for almost 10 minutes before entering. “He can’t see me crying. It will make him weak. Let us go in once I feel composed,” she hastily tells her husband, Sanket, as she struggles to hold back her tears. It’s January 6, three days since her 15-year-old son was picked up by Chembur police for “unlawfully assembling on the street”, “rioting” and the most serious of all – “voluntarily causing grievous hurt to any person being a public servant in the discharge of his duty”. Sarita’s son studies in class nine at a municipal corporation run school near Deonar. He is one of 16 boys, all below 16, to be booked and later lodged at Dongri Children’s Home for their alleged roles in the riot and vandalism at Chembur on January 3. Sarita, like other parents, has come to see her son. 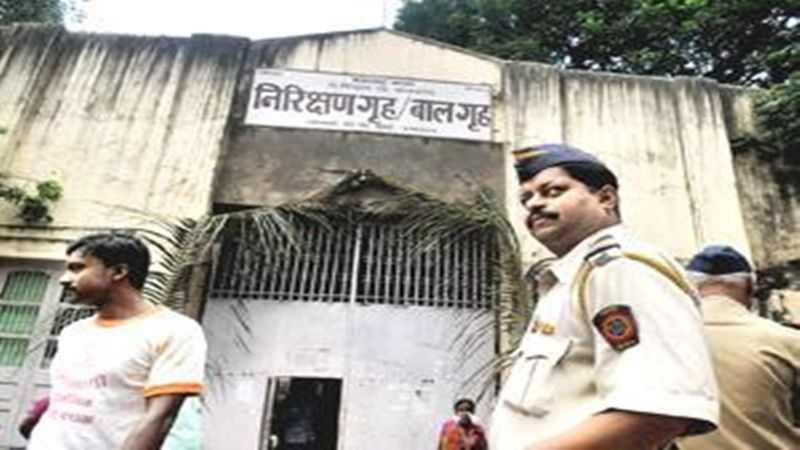 One law student from her neighbourhood in Govandi had told her that her son Rahul might be kept in “jail” for 10 years. “That boy told me the sections are grave. He opened some page on his mobile phone and read it aloud,” Sarita says. “Ataa daha varshaa saathi gela samjha tumcha mulga (your son has gone in for 10 years now),” Sarita recalls his exact words. But once she steps inside the observation home and speaks to the social workers from the Resource Cell for Juvenile Justice (RCJJ) – a field action project started by the Centre for Criminology and Justice Department of the Tata Institute of Social Sciences (TISS) – Sarita gets some clarity. “They (social workers) said under-18 children cannot be kept here for more than three years. But my son is still a child. He is innocent. I cannot let him be here for even a day more,” she tells The Wire while waiting outside the probation officer’s office, hoping to see her son. According to S. Mane, senior police inspector from Govandi, Sanket, Rahul, along with 39 others, had indulged in vandalism and caused harmed to public property. 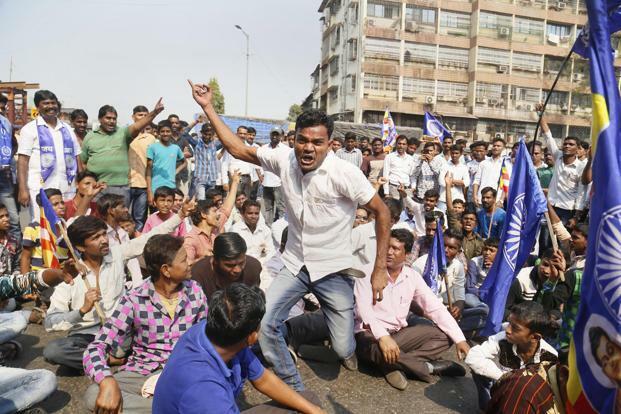 These teenage boys, according to the police, were out on the street protesting against the violence unleashed on Dalits at Bhima Koregaon near Pune on January 1. But Sarita says her son was on his way to tuition class. “He was wrongly booked,” she repeats to everyone she speaks to in the next six hours inside the juvenile home. The Kamble couple had to wait for over an hour before they meet Rahul. He’s no longer in his school uniform – dark blue pants and white shirt – that he was wearing when he had left his home. It has been replaced with a yellow t-shirt with stripes and brown shorts. “Who gave you these clothes?” she enquires. Rahul stands there with his head bowed. “Jail cha uniform aahe ka ha? (is this a jail uniform? ),” she asks him. Rahul nods. By then four other boys join him. All of similar age, build and in similar striped t-shirts and brown shorts. They were all brought to Dongri home on January 3. Of the 16 children, one was released on the same day. “He was bleeding profusely. Mirror shards had pierced him deeply and ruptured his skin badly on the right side of his body. He was in a terrible state. The magistrate had ordered his release on the same day,” confirms a social worker at the observation home. The families allege that the police did not spare anyone. “Police have launched a manhunt against our children. They arbitrarily arrested them,” says Sukhdeo Khairnar, whose 14-year-old nephew was also arrested. “Arrested for what? Is protesting illegal?” asks an elderly woman. Her 16-year-old grandson was also rounded up. By 3 pm on January 6, the magistrate, Jyoti Purkar, calls all 15 children, one by one, to her chamber. Their parents are asked to furnish two independent sureties each. This means they had to find individuals with a regular job, stable income and the readiness to vouch for these children. Belonging to the lowest strata of the society, this is a lot to ask for. Families desperately begin making calls and scrounging for help. Within a few hours, some relatives and neighbours pour into the observation home. But the documents they’ve managed to assemble do not suffice. The last entry made in one of the bank passbooks was in 2014. Another person had come with his papers of his “zero balance bank account”. “Most women among us work as domestic help. Men in the family do odd-jobs. We do not have any family members with high income,” said one of the mothers. Finally by 4 pm, 13 families convince the Juvenile Justice Board. They children are then released against two “personal bonds” each. For two other kids – 14 and 16 year old – their families could not provide “convincing” sureties and their release is deferred for later. Most arrests in Mumbai were from the slums of Chembur, Deonar, Vikroli and Powai in the northeast region. People from Dalit Bahujan communities living here were also the ones who had travelled in huge number to Bhima Koregaon on January 1. Several private vehicles were booked to travel from different parts of Mumbai to Bhima Koregoan memorial. Most of them had to return mid-way after the violence on participants and visitors heading to the memorial. Since this was also the 200th anniversary of the Bhima Koregaon battle, an occasion of great importance to Dalits, the crowd this year had gone up from a few thousands to over two lakhs. “We suffered violence first hand at Bhima Koregaon. The call for bandh on the following day was only a response to it. Instead of arresting those involved in terrorising our community, the police has been busy arresting our children,” Khairnar says. The Pune police are yet to arrest the prime suspects in the Bhima Koregaon attacks – Manohar alias Sambhaji Bhide and Milind Ebute, both Brahmins and prominent Hindutva leaders. In Mumbai alone, close to 300 persons, all belonging to Bahujan communities have been arrested. 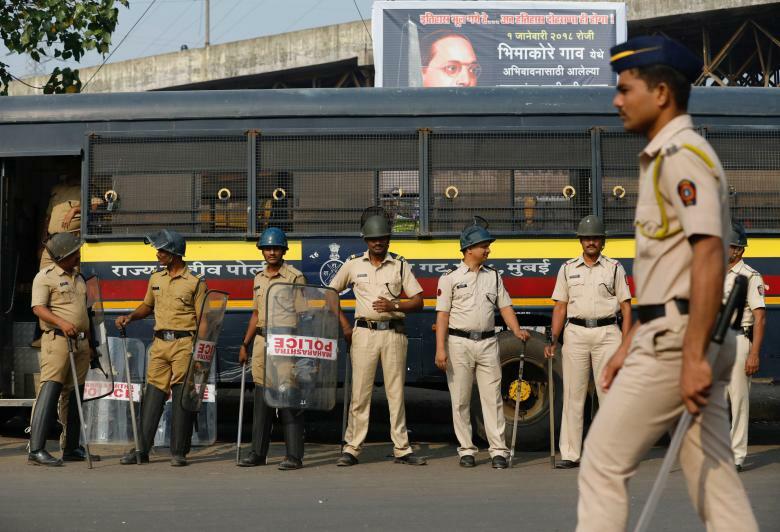 The Directorate General of the Police’s control room confirmed a total of 502 FIRs have been registered across Maharashtra in the aftermath of the Bhima Koregaon violence. “We have not collated any data so far on the number of arrests made. But most arrests have been in Mumbai, Aurangabad, Nanded and some parts of Nagpur,” says the officer attending to calls on Monday morning. News reports from various district confirms the number of persons arrested could be anywhere between 4,000 and 5,000. At least 5,000 more have been booked, but yet to be arrested. Besides being a part of unlawful assembly, most of them have been booked under serious, non-bailable charges such as vandalism and attempt to murder. Advocate Darshan Ingole, one of the young lawyers who have been handling many of these cases, feels many of these charges might not even stand the scrutiny of the court. “Most of them are trumped-up charges. But the purpose is not to convict these young kids, but to instill terror in their minds. Can you even imagine what a family dependent on daily wages goes through if they have to visit the court and police station every day?” he asks.